Fort Myers is a city in the southwest of Florida with around 70,000 inhabitants. Together with Cape Coral it forms the Cape Coral-Fort Myers Metropolitan Statistical Area, which has over 600,000 inhabitants. A county entitled Lee County, named so in honor of the southern commanding General, Robert E. Lee was established in 1887. By about 1908, the population of Fort Myers was approximately five to six thousand (Captain F.A. Hendry Reunion Committee, 2002). In 1912 the first local Black population only public school was established in Lee County (Williams Academy). Henry Ford bought the home and land next door to Thomas Edison in 1916. In 1920 the Jones-Walker Hospital was opened for the Black population only. Bunche Beach was dedicated as the first local beach intended for the Black population only, in 1949. In 1954, the Supreme Court ruled to end segregation in public schools. However, this decision was not implemented by integrating local Lee County schools until 1969. The Williams Academy was relocated to Clemente Park located in the Dunbar section of Fort Myers in 1995 and, is the primary center for African-American history in Lee County. The museum and administrative offices are established at 1936 Henderson Avenue (Lee County Black History Society, 2011). Butterfly Estates, 1815 Fowler Street, ☎ +1 239 690-2359. 9AM - 5PM. This butterfly conservatory, set in the Fort Myers river district, is home to all the species of butterfly native to Florida. The enclosure features a cascading waterfall and many exotic species of plants. Every Friday at 1:30PM new butterflies are released into the exhibit, which makes this the best time to visit. $15. Edison and Ford Winter Estates, 2350 McGregor Blvd, ☎ +1 239 334-7419. Every day 9AM-5:30PM (during Dec until 9PM). Guided tours through 15,000 sq. ft. museum with hundreds of Edison and Ford inventions and objects, video theatres, and changing special exhibits. Beautiful and interesting plantings on the grounds. Boston Red Sox Spring Training, Fenway South Dr (JetBlue Park at Fenway South), ☎ +1 239 334-4700. The Boston Red Sox also have their spring training in Fort Myers. Florida Gulf Coast University Eagles. 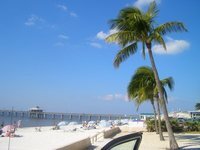 Fort Myers has a humid (sub)tropical climate with warm conditions year-round though with some distinct seasons. Summers are from May to October when temperatures are mostly between 30 °C and 33 °C during the day and around 20-24 °C at night. This is also the wet season with 70% of the annual precipitation (1,300 mm) falling from June to September (around 200-250 mm a month). Also, the occasional hurrican can strike the area with massive destructions possible. November to April is by far a better time to visit, with days of 24-29 °C and nights in the 13-17 °C range. There is still a shower or two but with around 50 mm a month most of your days will be quiet, sunny and dry. Southwest Florida International Airport (RSW), also known as Fort Myers International Airport, is the main gateway for Fort Myers and the surrounding area, including Cape Coral and Naples. It mainly has connections to other cities in the USA, but there are quite a few flights to Toronto and less so to Montreal and even Düsseldorf. Fort Myers has not had an railway service since 1971, but Amtrak provides an thruway bus from Tampa, connecting with its Silver Service between Miami and New York City. There are several daily departures from Miami with Greyhound, with journeys taking just over four hours. Key West Express has daily high-speed passenger ferries between nearby Fort Myers Beach and Key West, taking about 3.5 hours. Lee trans is the local bus service and has numerous bus lines criss-crossing the city. The tropical climate is perfect for bicycling, and Fort Myers is a very bicycle friendly city. But watch out for those occasional pop up showers, especially during the wet season. When cycling, be sure to bring plenty of water, wear light weight, light colored clothing, and wear sunscreen. Plakka Greek Restaurant, Fort Myers Beach. Iguana Mia Mexican Restaurant. Fort Myers Beach. Hooters of Fort Myers, Fort Myers. Siam Hut, Cape Coral Pkwy and Del Prado. Thai. Matanzas's Inn, Fort Myers Beach. Parrot Key, Fort Myers Beach. Blu Sushi, Fort Myers and Gulf Coast Town Center. Capt'n Fishbones, North Fort Myers, across the main parking lot at The Shell Factory. The Fish House, 320 Old San Carlos Blvd, Fort Myers Beach. Ford's Garage, 2207 First St. 11:00 - 11:00. Spirits of Bacchus, Downtown Fort Myers. The Cigar Bar, Downtown Fort Myers and Gulf Coast Town Mall. Rivals Sports Kitchen, Miromar Factory Outlet Mall, Estero. Blu Sushi, Fort Myers and Gulf Coast Town Center (Estero). Anthonys Junkanoo, 3040 Estero Blvd. Nice beachclub with full bar. Best Western Springs Resort, 18051 South Tamiami Trail. Marketed as a "tropical hideaway with a unique natural warm mineral water springs." Onsite family restaurant and a poolside Tiki Bar. Best Western Waterfront, 13021 N. Cleveland Avenue, ☎ +1 239 997-5511, toll-free: +1-800-274-5511. Right on the river. Private pier, high-speed internet and heated outdoor pool. Cypress Trail RV Resort, 5468 Tice Street, Fort Myers, FL 33905, ☎ +1 239 333-3246. Luxury RV resort with aquatic center and recreation that includes two private lakes and paddleboats. DiamondHead Beach Resort, 2000 Estero Boulevard, toll-free: +1-888-627-1595. Fort Myers Beach. All suite luxury resort with conference facilities. Right on the beach. GullWing Beach Resort, 6620 Estero Boulevard, ☎ +1 239 765-4300, toll-free: +1-888-627-1595. Suites and condos on Fort Myers beach as well as meeting and banquet space. Howard Johnson Inn, 4811 s Cleveland Avenue. Old motel located in the center. Hyatt Regency Coconut Point, 5001 Coconut Road (Bonita Springs), ☎ +1 239 444-1234, fax: +1 239 390-4344. Lover's Key Resort, 8771 Estero Boulevard, ☎ +1 239 765-1040, toll-free: +1-877-798-4879. All-suite resort adjacent to the Lover's Key State Park with views of Estero Bay, lagoon-style pool, and on-site dining. Pink Shell Beach Resort & Spa, 275 Estero Boulevard. On Estero Island. Pointe Estero Beach Resort, 6640 Estero Boulevard, toll-free: +1-888-627-1595. A beachfront suite hotel located on the peaceful southern end of Estero Island. Santa Maria Harbour Resort, 7317 Estero Boulevard, toll-free: +1-888-627-1595. A resort on Estero Bay, a fishing harbour on Estero Island. Suburban Extended Stay Hotel of Fort Myers, 10150 Metro Parkway, ☎ +1 239 938-0100. Rooms have refrigerators, microwaves, coffee makers, utensils, irons, ironing boards, computer hook-ups, voice mail and satellite television. King suites are also available. Fort Myers Airport Hotel, 9401 Marketplace Road, ☎ +1 239 454-0040. Located near the Southwest Florida International Airport and features complimentary wireless internet and breakfast buffet. Sanibel Harbour Marriott Resort & Spa (Sanibel Harbour Marriott), 17260 Harbour Pointe Drive. Fort Myers, Florida 33908, ☎ +1 239-466-4000, toll-free: +1-800-767-7777. Check-in: 4:00 PM, check-out: 11:00 AM. Oceanfront resort on private 85 acres of land and offers free WiFi, full service spa, and guest rooms with water views. We have a comprehensive list of accommodation in Fort Myers searchable right here on Travellerspoint. You can use our map to quickly compare budget, mid-range or top of the range accommodation in Fort Myers and areas nearby. This is version 16. Last edited at 8:06 on Mar 13, 19 by Utrecht. 15 articles link to this page.